I received this email from a friend of my mother’s in Cape Town and I’m now in love with this beautiful dog. If I had a garden I’d adopt Brutus in a heartbeat. 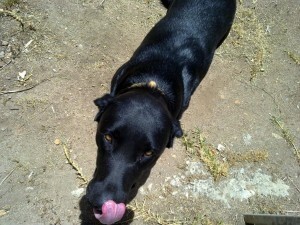 A house-trained and loving Lab who’s only three years old? Those don’t come along very often. If you’re looking for a family dog and would like to skip the growing pains of a puppy, take a look at Brutus. 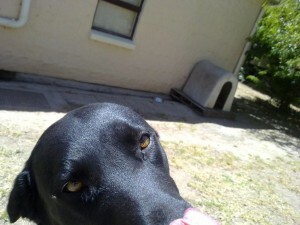 “Brutus, an almost 3 year old male, black Labrador lives next door to us in Somerset West. Over the past year we have come to know him as a wonderful character, with a lovely nature. Unfortunately his owners are not in the position to give him the attention and love he so deserves and he spends all week and most of the weekend alone with no company or stimulation. From time to time we have taken Brutus on walks and even introduced him to some basic training and have found him to be most responsive to the attention. He has also demonstrated a real willingness to learn. He is excellent with people and is well behaved with other dogs. He also isn’t a big barker. 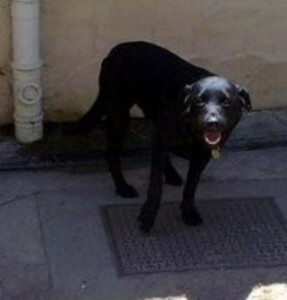 Although not yet neutered he is a gentle soul, who just needs lots of love, exercise and attention. Our neighbours realise that he needs a more suitable home and have agreed to his re-homing so that he can bring joy to a family who is willing to love and care for him. I’ve been here nearly two weeks after our “semigration” from my home city of Cape Town. Most of it’s been spent unpacking boxes, drinking too much whisky and driving around the megalopolis trying to find decent furniture. The GPS has taken me through Mayfair, similar to the rougher parts of Woodstock with its seedy slum feel, and a suburb called Blairgowrie, which could have been directly transplanted from Cape Town’s Plumstead. Then there was Fourways. Fourways defies comparison, but imagine Parklands mixed with Belville, multiply by 20 and wave a Tuscan wand over it. I know it’s unfair and probably more than a little inaccurate to draw parallels with Cape Town areas, but hey, it gives me a sense of order. Desperately needed in a place that seems to sprawl and disseminate itself without end. I visited Parkhurst and felt like the démodé cousin from a less stylish country. New Zealand perhaps. Oriental Plaza was far more fun and affordable for someone who’s spent numerous days of her life hunting bargains at Access Park. It’s a bit rougher and much bigger than Access Park, with more Indian clothing and less sombre Muslims. The coconut samoosas from World of Samoosas are incredible, and I sat in the sun quite happily munching five or six of them. Ah yes, the sun. The Joburg weather in general really. Yes, it’s very cold at night, but the days are magnificent for someone who only knows July and August as raining, grey, sleeting or storming. How can I explain the simple joy of putting on lipgloss without having to check the wind speed first? Or hanging up a load of laundry and having it dry in one day? Unfortunately this dryness also extends to lips, skin, sinuses and even my eyeballs – I used a pack of CelluFresh and a tub of Body Shop Shea Body Butter in a week. Still, worth it for the 22-degree midday high. Then there’s the usual question – are Joburgers really friendlier? Well, yes, largely by dint of socialising like the world’s going to end tomorrow. I’ve gone out more in the past two weeks than I would in two months at home. Joburgers have also been incredibly welcoming and helpful to a one-city woman who feels rather misplaced and clumsy at this altitude. And, unlike Capetonians, nobody asks, “What school did you go to?” within five seconds of meeting you. So to avoid being a sulky and morose émigré, I’m going to discover and embrace all the fantastic little things about living here. Like the fact my Cape Town apartment could fit into the bedroom of my Joburg one. Or that virtually every restaurant has halloumi on the breakfast menu. And that Mozambique is within driving distance. He’s right. And I’m going to do, see, touch, taste and experience as much of it as I can. Starting with those coconut samoosas.